All music composed, performed and recorded by Bryan Helm. All rights reserved by the artist. This is the first program in this series to taken from tracks recorded to Mini-Disc rather than tape, a slow nod to the 21st century. 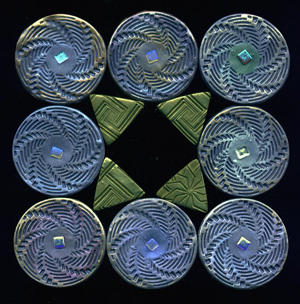 Arrangement of polymer clay pieces with dichroic glass centers by yours truly. Thanks for stopping by, there’s more coming soon, meanwhile try to stay cool.